“We love to decorate our homes for the holidays,” said Karl Jandrey, an assistant professor of clinical small animal emergency and intensive care at UC Davis. “But, we need to keep in mind that some of our decorations and treats can be hazardous to our pets. “Thankfully, most of the items ingested are only minimally harmful. 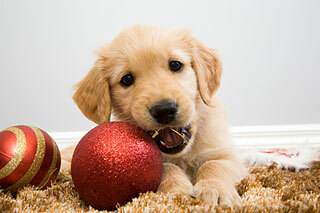 However, some seemingly harmless holiday items can cause internal damage or even death to your pet,” he said. Keep a close eye on your cats and dogs around these items to help to ensure a safe and happy holiday season. The best medicine may be prevention. The UC Davis Veterinary Medical Teaching Hospital is open and ready 24/7 for emergencies during the holidays. The William R. Pritchard Veterinary Medical Teaching Hospital at the University of California, Davis — a unit of the School of Veterinary Medicine — provides state-of-the-art clinical care while serving as the primary clinical teaching experience for veterinary students and postgraduate veterinarian residents. The hospital treats more than 35,000 animals a year, ranging from cats and dogs to horses, cows, and even more exotic species. To learn more about the hospital, please go to our website, and follow us on Facebook and Twitter.